9 Handbag Essentials for Women on the GO! When work is busy and your list of to-dos is never-ending, having the right handbag essentials is a must. Once I took time to think ahead and carefully select things I often need, it was amazing to see how my busy days felt a little less hectic. This may seem like a no-brained for some of you, but going through my work tote every week or so automatically makes my work/life schedule and routine fall into order. If you have looked for something in your desk that is already in your bag, or you have thought something is in your bag when it’s really at home, just know that I have been there (sooo many times)! I know how annoying and time consuming that can be. So, in hopes of helping you make your work bag work for you, here is a peek inside my handbag! This may seem like a no-brainer, but a proper wallet that can hold all your cards and coupoons is a simple way to increase your level of organization. Chapped lips can be a major distraction, especially if you are on your way to the office for an event or important meeting. Enough said.. I always need these, and in all the colors! I’ve talked about my LifePlanner before, and my love for it has only grown since I got mine. It is a great way for me to set and track goals in addition to keeping up with my schedule. I love to have a pair of sunglasses living in my bag at all times. That way I don’t have to think about it, and I’m prepared whenever the sun comes out. This stuff is the BEST drugstore mascara. It is a must for when you need to freshen up in the middle of the day. Lancôme’s Lip Lover is an all-time favorite lip gloss for me. It’s not sticky. It’s well pigmented and it lasts a long time! When a meeting goes over or your lunch just didn’t cut it, a snack like this is a must in order to keep me from crashing or falling asleep on my keyboard. Nothing is worse than spilling coffee on your shirt when your day is just getting started. These things save me all the time! In addition to these essentials, there are always non-essentials floating around in my bag, like bills, receipts or tickets (oh my!). In order to keep these from getting in the way of my essentials, I aim to clean out my work bag every week or so. The handbag I currently use is by Kate Spade from a surprise sale. Here’s a similar one in the same color and another tote that is the perfect color for fall. The internal pockets and compartments, along with the sturdiness of the bag really help me stay organized. Do you have similar essentials in your work bag or in your everyday bag? How do you keep your handbag organized? I’d love to hear all about it. This week SC’s Scoop turned one year old, which means I’ve completed a full year of blogging! Say what!?! At the same time, blogging has been much harder than I thought it would be. I have put more time and energy into it than I expected to, but at the same time all the effort I put into this blog is a direct reflection of how much I enjoy it. Before I begin to ramble (and bore you! ), I want to share the most popular blog posts and my personal favorite blog posts since SC’s Scoop began. I’ve learned A LOT in this past year and recently shared some advice for new bloggers that may be helpful if you are thinking about starting one. 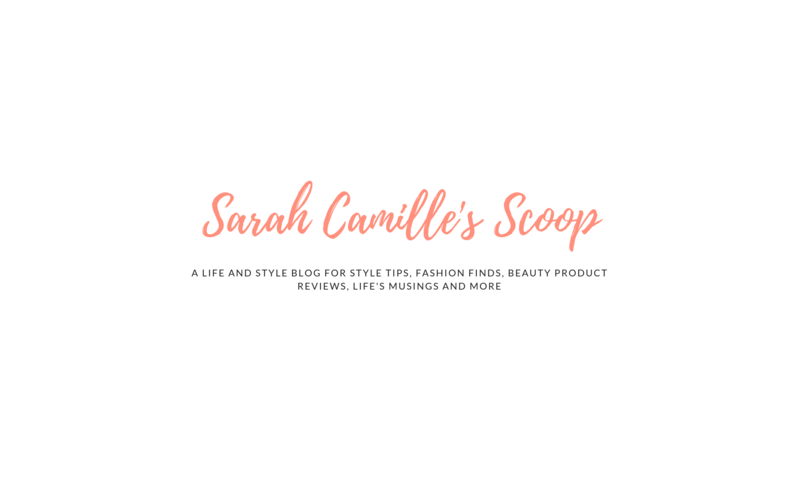 My favorite things about blogging are building relationships with other bloggers and having ownership over a creative outlet that also acts as a filing system for memories. The two biggest highlights for this past year have been my nomination for the Blogger Recognition Award and monetizing my blog. I did not originally create my blog to make money off of it, so creating an income stream has been eye-opening and exciting. It is amazing to think how my skills have improved with marketing, social media and search engine optimization as well. I would love to know what you’ve enjoyed about my blog, and if you have any favorite posts. For my fellow bloggers, what did you learn in your first year? Did you have any special moments or big highlights? What is your favorite thing about blogging? I’d love to hear your thoughts. P.S. Stay tuned for a feature on the outfit I’m wearing in the top photo. All the clothing details will be up on Monday.